The Feminist Art Conference (FAC) is thrilled to present ‘You’re Not Here’, a month-long celebration of feminist art in honor of International Women’s Day. The exhibition will inhabit the hallway galleries of Daniels Spectrum in Regent Park, a neighbourhood where residents were forced to relocate during the city’s revitalization efforts. Through a range of media, including painting, photography, video and performance from over twenty-five artists, the art represents a fight to exist, to remain, and to be visible. ‘You’re Not Here’ runs from March 3rd to March 31st at Daniels Spectrum, 585 Dundas St East, in Toronto. The exhibition will kick off with a launch party on Tuesday, March 3rd from 7 pm to 10 pm, featuring live performances from multiple disciplines. 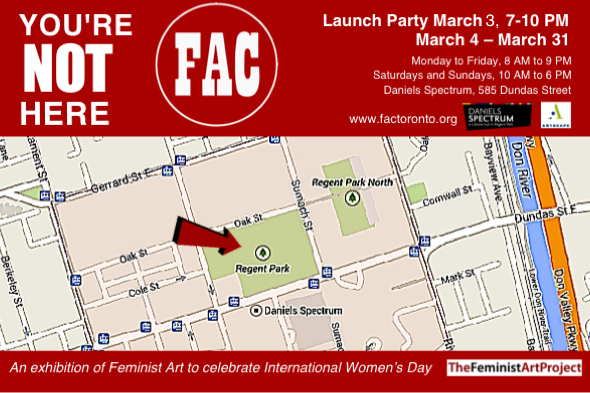 The launch is Pay What You Can with all proceeds going to support the FAC 2015 conference and exhibition to be held at OCADU September 24th to 27th.